﻿﻿﻿﻿﻿﻿﻿﻿Martin Dies Jr. offers creative new ways to enjoy nature. ﻿﻿﻿﻿As our group paddles around the curve of a slough, Kimberly spots an anhinga along the side of a creek. The bird throws a large fish up into the air and catches it, and we put our paddles aside to watch as the fish is devoured in one gulp. “Wow, I can’t believe we just witnessed that!” the wide-eyed young visitor exclaims. The encounter was unexpected, but the trip made it possible. Interpretive rangers at Martin Dies Jr. State Park in Jasper use these opportunities to encourage visitors to think about nature, giving them a variety of new, fun and thought-provoking experiences. 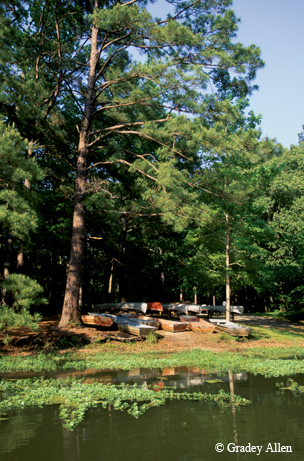 ﻿Visitors to Martin Dies Jr. State Park can enjoy a variety of activities, such as fishing, canoeing and hiking. Another day finds interpretive rangers at the park’s nature center leading a nature journaling activity with the same goal in mind. With watercolors, pencils and crayons in hand, participants learn to slow down and focus on details of the objects they have chosen to draw. Artistic expression encourages participants to make a deeper connection with nature that can’t come from an encyclopedia. For those who’d rather experience nature at their own pace, the park rents canoes and bicycles for the many paddling and foot trails. Majestic cypress trees and secluded sloughs make these journeys so much more than just good exercise. The park offers a variety of low-cost ways to experience nature every week. Many programs begin at the park’s nature center, a discovery space full of hands-on exhibits open on Fridays and weekends. Check with park headquarters staff or the park website for more information on programs, events and activities. Martin Dies Jr. State Park is located at B.A. Steinhagen Lake along U.S. Highway 190, two hours northeast of Houston. For more information, call (409) 384-5231 or visit www.tpwd.state.tx.us/martindiesjr.